November usually marks the time for the first parent teacher conference. Our experience with them was spotty, and in this post I explain what I learned so far from this experience and what I want to do differently this year. Do You Find Parent Teacher Conferences Stressful? You would think that we have nothing to worry about heading out to the parent-teacher conference. Smarty is a very strong student who excels at all subjects. We have never heard anything but positive feedback from teachers on her performance. Yet… I feel stressed going to see her teachers, because I never feel that we are on entirely same wavelength. Her K and 1st grade teacher was great (it was the same teacher, twice a combo class), but she was admitting herself that Smarty was never adequately challenged in her classroom. She was the one who told us, Even if you put her 2 grades higher, academically it will still be too easy to her, but emotionally she won’t be ready for it. Then we had a second grade teacher which failed to deliver or delayed as much as she could every agreement that we reached during a parent teacher conference and during subsequent meetings later in the year. Smarty’s third grade teachers was by far the best in getting Smarty right. She wrote on her first report card, Smarty is the wisest and most enthusiastic third grader I had a privilege teaching. Smarty had an excellent year with Mrs L., because she had freedom to choose her tasks and a range in which to challenge herself. Mrs L. did not seem overly concerned with performance on tests, yet Smarty nailed her third grade SBAC tests just the same. Now, I feel that we are back in second grade, with the more “traditional” teacher who is very big on discipline. This is why I am looking to parent teacher conference with a fair amount of trepidation. Looking back at the previous teacher-conferences, I realize that it was not really a dialogue. I do not fault the teacher, I fault myself for falling back into "teacher is always right" mentality and failing to challenge some of the things that were said or failing to ask for specific "next steps". We have already been more active this year with more communication to the teacher than ever before in the first two months. I am sort of beyond the fear to be listed as "that helicopter parent", but I am also teaching Smarty to speak more for herself in the classroom. More on that is in another post. I read a good article about 5 things to discuss during parent teacher conference, and it talked about discussing and setting academic goals for the next term. This article made me wonder why we have not ever thought of directly asking this question before. However, this year we won’t have to, because the teacher already sent a note saying that this is exactly what we would be doing this year during a conference – discussing progress and setting goals. I am very curious to hear what she has in mind for Smarty. How do you set academic goals for a 4th grader who is reading on college level and is fascinated by algebra? I am hoping that she is thinking more along the lines of independent study, but I am not holding my breath on this just yet. In preparation for this conversation, I asked Smarty to consider what her academic goals should be for this year and gave her some time to think it over, since we won’t have a conference for another two weeks. Of course, the teacher might be thinking more about “non-academic” goals like, perhaps, organizational skills where Smarty could definitely use some improvement, but I intend to ask specifics about academics anyway. Should Parent Teacher Conference Include Children? This will be the first year where conference will be conducted with Smarty (not just in our case, but it will be the format for all 4th grade conferences). I have mixed opinions about this format. On one hand, I think it’s important for a teacher, a child, and his/her parents to be on the same page regarding their strengths and weaknesses. On the other hand, I think that it puts us at a disadvantage if we are not in agreement with the teacher. I suppose that we will still have an option of scheduling a separate meeting in this case, but somehow I tend to think that parent-teacher conference is named so for a reason and it gives a chance to discuss certain concerns out of earshot of students. Anyway, I am trying to keep an open mind about it. At least, our daughter is unlikely to be intimidated. My husband joked that if the teacher asks Smarty about how her education should look like, she is going to regret this question many times over, because Smarty has a lot of opinions about it – don’t make us sit all the time, more hands-on work, too many worksheets, I want to work ahead in math, less group work, etc. Perhaps it will be a good opportunity for her to share some of these thoughts not just with us but directly with her teacher. 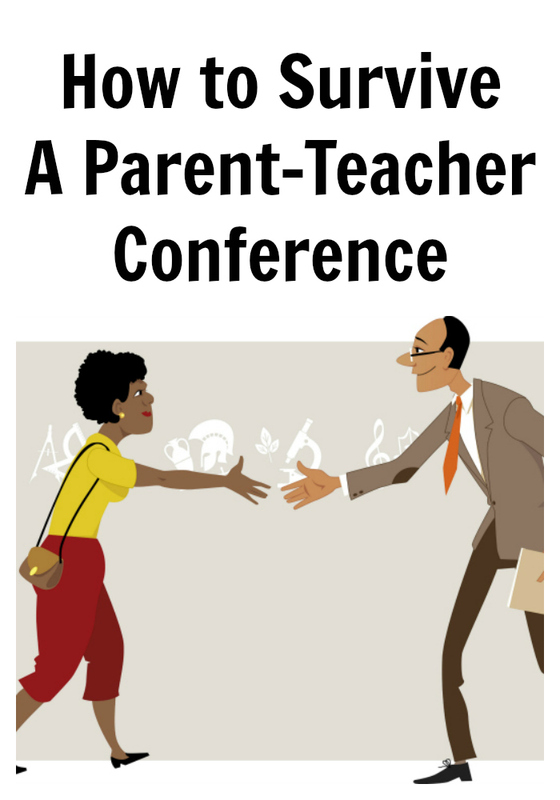 Have you had your parent teacher conference yet? How did it go? Mine have gone well so far. It gets easier as the school gets to know our family, I find. Back when I was teaching including students in the parent teacher conference was a big thing and we were strongly encouraged to do it. I had a form to fill out and everything.